The kind of soil that you plant your lawn in will determine the amount of nutrients that your lawn receives. That is why it’s so important to have soil tests done every three to five years. You want to be aware of what nutrients your lawn is lacking, and whether any nutrient has reached a toxic level. When you receive your first soil test report, it may seem like a confusing jumble of scientific abbreviations and numbers. But we have a few definitions below that will go a long way in helping you decipher the results. 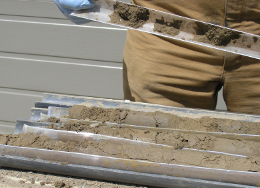 Here’s a breakdown of what you should expect and look for in your soil test report. Soil pH: The pH level of the soil will affect the growth of your lawn more than any other factor. Most lawns will grow best in soils of a pH of 6.3 to 7.0. Anything below 6.0 is acidic, which will limit the availability of nutrients such as calcium and magnesium. Anything above 7.0 is alkaline, which will limit the availability of micronutrients such as iron, manganese, boron, copper, and zinc. Lime recommendations: If your soil’s pH level is below 6.0, the soil test report will probably have a recommended amount of lime that you should apply to the soil. Lime replenishes the calcium and magnesium that is lacking in the acidic soil. If the recommended amount is more than 50 lbs. per 1,000 sq. ft., then break it up into smaller applications. (There is less you can do for alkaline soil. Elemental sulfur can help, but it should only be used if it is specifically recommended in the soil test report). Nitrogen: Nitrogen is the element most needed by your lawn, as it affects color and growth rate. 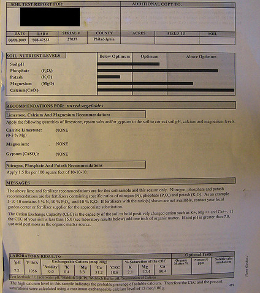 Your soil test report, however, will not be able to give you an accurate reading of the amount of nitrogen in your soil. The reason for that is nitrogen is available in a variety of forms that are difficult to measure. The amount of nitrogen is also constantly changing, so the report can only account for the nitrogen levels when the samples were taken. Try to do soil tests right before planting or fertilizing for the most accurate readings. Phosphorus: Phosphorus is needed in smaller amounts, and is instrumental in helping new lawns become established. A normal amount of phosphorus would be 50 to 75 lbs/acre or 60 to 80 parts per million (ppm). Potassium: Potassium is an element that helps strengthen a lawn’s endurance and tolerance for stress. A normal level of potassium would be 200 to 250 lbs/acre or 120 to 510 ppm. Fertilizer recommendations: Your fertilizer recommendation will tell you the amount of nitrogen, phosphorus, and potassium that you should apply to your lawn in either lbs/acre or lbs/1,000 sq. ft. Because nitrogen is so hard to measure, the nitrogen recommendations will probably be based on your grass seed type and the region that you live in. Remember that it is better to break up fertilizer into smaller applications—and you should never apply more than 1 lb. of pure nitrogen per 1,000 sq. ft. at one time. Calcium/Magnesium: These two elements, while not as prominent as the nitrogen, phosphorus, and potassium, are still very much needed by the lawn, and a lack of these elements usually means the soil is acidic. Normal levels for calcium are 800 to 15,000 lbs/acre or 700 to 1300 ppm. Normal levels for magnesium are 150 to 2,000 lbs/acre or 140 to 270 ppm. Iron, Boron, Zinc, Copper, Manganese, Sulfur: These micronutrients are very rarely lacking in the soil, so you won’t need to apply them. It is more likely that you will have to deal with toxic levels of one of these elements. Cation Exchange Capacity (CEC): This measures the number of possible exchange sites on the soil particles where cations (positively charged atoms) such as hydrogen, calcium, magnesium, potassium, sodium, and ammonium can be retained. The higher the CEC, the less likely nutrients can be leached from the soil and the higher potential the soil has for fertility. CEC is not adjustable and usually depends on the type of soil that you have. More sandy soils usually have a CEC of 1 to 15, while silt or loamy soils have a CEC of 15 to 30, and soils with more clay have a CEC of 30 to 50. Base Saturation: Base saturation the percentage of cation exchange sites that are not being occupied by hydrogen or aluminum cations. This saturation is broken down into the elements of calcium, magnesium, potassium, and sodium. Calcium should occupy 40 to 80% of these cation exchange sites, magnesium should occupy 10 to 40%, and potassium should occupy 1 to 9%. A soil with a low base saturation is usually acidic. Electrical Conductivity: Sodium is an element not used by lawns, but that should still be measured because of its potential toxicity. Electrical conductivity measures the amount of soluble salts in the soil. 4 dS/m is a normal amount. The Exchangeable Sodium Percentage, or ESP, shows the percentage of cations in the soil that are sodium. If this percentage exceeds 15%, then you have a salt problem in your lawn.